Apple could potentially update the Mac Pro with Intel's new Xeon E5 processor that debuts next week, reports MacRumors. The Inquirer got an early look at Intel's Sandy Bridge E server chips which have been in the distribution channel for several weeks. Manufacturers, like Apple, would be able to release devices utilizing the processor soon after it debuts. Boston confirmed to The INQUIRER that Xeon E5 chips have been in the channel for a few weeks now and confirmed to us that it won't be a paper launch. We have also been shown Xeon E5 systems from other large vendors that give credence to the notion that Intel's Xeon E5 will arrive, for real, next week. 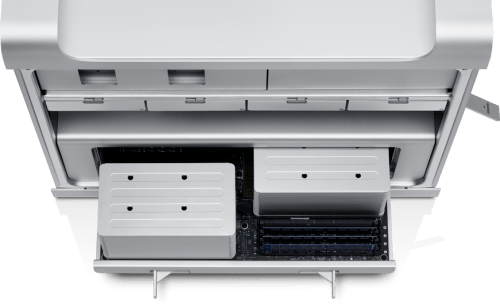 MacRumors suggests that Apple could use the E5-2600 series 6-core and 8-core chips for its dual-processor Mac Pro configurations and the E5-1600 series 4-core and 6-core chips for the lower end models. Last month, M.I.C. Gadget reported that Apple would not use Sandy Bridge and instead wait for Ivy Bridge. Reports indicated that Apple was having overheating issues with Sandy Bridge CPUs. The Ivy Bridge platform features "tri-gate" transistors that are 30%+ more efficient with heat dissipation and get the overheating issues under control. In addition, the site predicted that Apple would drop ATI graphics for Nvidia.